This homage to the Lone Star State’s most irresistible steaks showcases hundreds of recipes. Featuring beautifully photographed offerings from steakhouses, ranches, and restaurants throughout the state, this volume takes readers on a ride down the Chisholm Trail through the history of Texas’ steak culture. 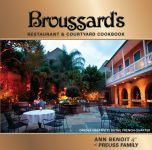 Broussard’s, one of the “Grande Dames of Creole Cuisine,” grew out of a love story and that tradition has defined the legacy that the Preuss family now nourishes. Broussard’s pays homage to its nineteenth-century roots while embracing a new generation’s esthetic. As a leader in New Orleans cuisine, Broussard’s continually re-creates the Creole tradition, bringing about a flawless melding of time honored classics with modern flavors and contemporary trends. Written by award-winning chef, culinary instructor, food columnist, and bakery director Bev Shaffer, this tasted-and-tested collection spans the brownie spectrum. In addition to a history of brownies, baking basics, and useful information on chocolate, the recipes collected here include everything from classics like Deluxe Brownies with Caramel Sauce and Swirled Brownies to more adventuresome suggestions like Raspberry-Mascarpone-Filled Brownies, Kahlua Brownies, Macadamia-Nut White Brownies, Cappuccino Brownies, and much more. Fans hungry for Buster Holmes’ flavors can use his very own recipes and, while a pot of beans simmers, walk down memory lane with historic photographs, facts, and anecdotes about the restaurant and its beloved owner introduced by a new foreword from award-winning food historian Poppy Tooker. “If anyone can make low-fat dishes taste delicious, it’s Jude Theriot. This style of cooking is exactly what health-conscious cooks desire-great flavor without a lot of fat. 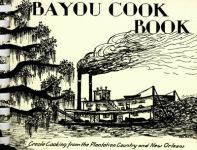 Jude’s entertaining style of cooking in Cajun Healthy will make all America have a change in taste.” Hardcover.